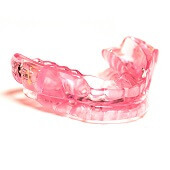 For patients dealing with mild to moderate sleep apnea and snoring, oral appliance therapy offers a conservative and comfortable treatment option. It can help those who are either CPAP intolerant or looking for a simple solution to their sleep issues. Dr. Shelley is certified by the American Board of Dental Sleep Medicine, so she’s able to custom-design our patients’ appliances so they are both effective and fit like a glove. 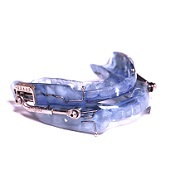 Could oral appliance therapy be exactly what you need to start getting the quality sleep you deserve? Read on below to learn more! Why Choose Powell Dental Sleep Solutions for Oral Appliance Therapy? 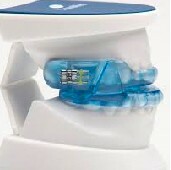 Oral appliances for obstructive sleep apnea (OSA) attempt to open the airway by altering the position of the lower jaw. The tongue and jaw are connected to muscles and ligaments throughout the back of the pharynx and can allow the airway to open and stabilize when gently stretched. The anatomy of a patient’s neck, jaw, airway, tongue, and oral structures are influential in the ability to open the airway. Our complete screening will identify physical and behavioral factors that may influence the effectiveness of your treatment. Oral appliances are an accepted and common treatment for sleep-related breathing disorders such as OSA, snoring, and their associated symptoms. They are intended to decrease the frequency or duration of apneas, hypopneas, and/or snoring events. They have been shown to improve nocturnal oxygenation and reduce the adverse health and social consequences of OSA and snoring. They can be used as a standalone therapy or in combination with other common sleep treatments. 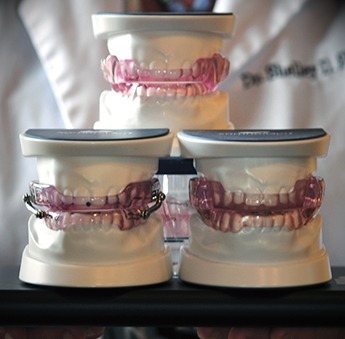 An oral appliance must be custom fabricated using impressions and models of an individual patient’s oral structures. It should not be constructed from a prefabricated item that is trimmed, bent, relined, or otherwise modified. It should be made of biocompatible materials and have a mechanism that allows the mandible to be advanced in increments of 1mm or less. It should also maintain a stable relationship to the teeth and retain its setting during use. 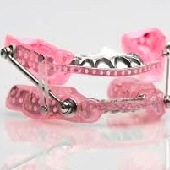 The oral appliance must also maintain its structural integrity over a minimum of 3 years. These requirements must be met to qualify as a medical device that treats OSA. 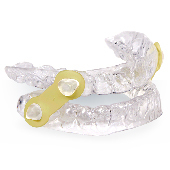 The SomnoDent Fusion is an oral appliance that has adjustable side wings placed closer to the biting surface. It provides 8.5mm advancement in .1mm increments and can be made with SMH BFlex material for greater comfort. 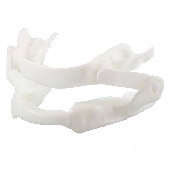 This device is useful for patients with large protrusive ranges of their lower jaw, thus requiring reduced resets. It may be contraindicated in patients with lateralized bruxism. The SomnoDent Flex is fabricated with the unique SMH BFlex material with a soft inner liner which maintains retention and offers premium patient comfort. It is useful for a patient with short teeth, little undercuts or bridgework. The device requires minimal chairside adjustment. The lateral mechanisms advance in .1mm increments with a total range potential of 5mm. Patients are pleased with the comfort and fit of this appliance and adapt easily. The SomnoDent SUAD, formerly known as the SUAD Elite, features a casted frame that circumferences the arches and creates strength. The modified Herbst design allows for lateral movement and easy titration with either spacers or telescoping arms. 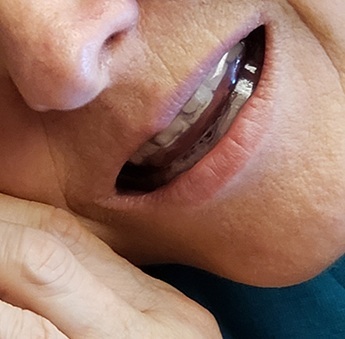 The non-restrictive movement allows patients to fully open and close their mouth, drink water, speak clearly yawn, and take medication while wearing their appliance. 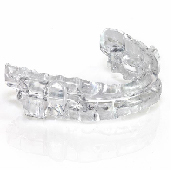 The upper and lower jaws are not locked together with this appliance and it has unlimited protrusive movement capability. 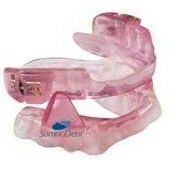 The SomnoDent SUAD Ultra incorporates a thin lingual apron behind the lower front teeth for dental support. The appliance offers increased tongue space with a cast frame that increases strength. The completely encapsulated casted substructure ensures that the teeth will not move. The SomnoDent Herbst Advance has improved the accuracy and ease of calibrating the jaw position with this design. It is comfortable and easily adjusted, has a high level of patient satisfaction, has a visual calibration indicator for ease of titration, has a generous 8mm range of titration capability, is available with the soft flex liner or ball clasp retention, and is Medicare approved. The SomnoDent Edentulous Herbst Advance option is Medicare approved for those patients who wear a single or complete denture. The SomnoDent Air/Air+ is an innovative device with both comfort and high-quality features. It is available with either ball clasp liner or the flex liner. It is easily adjusted chairside. The lateral mechanisms are adjusted with .1mm increments and a total protrusive capability of 5mm. The lateral wings are smooth and provide comfort to the cheeks for the patient who prefers to sleep on their side or with their hands next to their face. This device is one of our most popular items! CPAP intolerant patients. 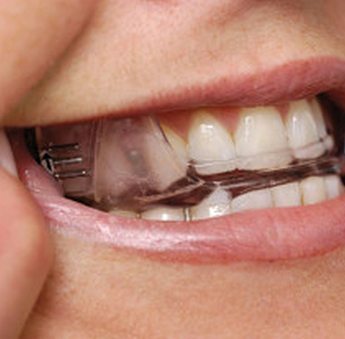 DentiTrac uses patented and sophisticated anti-deception algorithms to determine when a patient is wearing their device. The SomnoDent appliances are the only ones powered by DentiTrac. The benefits of utilizing the compliance recording device are that it is uniquely compliant in 96% of SomnoDent OAT wearers. It is highly effective in demonstrating accurate efficacy with uncompromised accuracy. It measures hours worn and head position and delivers daily summaries. The data is HIPAA secure and cloud based, allowing the patient or practice records to be accessible from anywhere. It includes a thermal sensor, accelerometer and a 6 months micro-recorder warranty although it has an expected 5-year warranty. 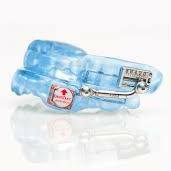 The oral appliance device has a SomnoDent 1-year device warranty. Many employers and payers offer Sleep Wellness programs to their employees and realize cost savings and productivity gains for the company through improved health of their employees. 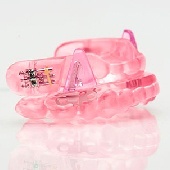 The ProSomnus IA is the first sleep apnea appliance that’s specifically tailored to each patient’s unique treatment plan. The device has several characteristics that can be adjusted as necessary, such as the post angles, the amount of opening to the airway, and the anterior discluder – there are even metal-free hooks for elastics! As a result, the patient’s treatment outcome is optimized and made highly efficient, and their overall care experience is more comfortable than ever before. 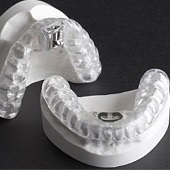 The ProSomnus CA is brand-new to the world of dental sleep medicine, and it’s the first precision continuous advancement Oral Appliance Therapy device available. This state-of-the-art device expertly combines expanded screw titration with brand-new, forward engineered features for a much more efficient and predictable care experience overall. By using a brand-new, three-dimensional Linear Guide, we can ensure that the left and right titration posts are able to advance at precise angles that are symmetrical to the desired path for each individual patient. Like its name would indicate, the Panthera is a sleek oral appliance that fits snuggly over the teeth and leaves plenty of room for the tongue. It is made of high-quality plastic, and it can be easily adjusted to provide a comfortable fit using a pair of small straps on the side. It can prevent blockages in the upper airway that lead to both snoring and sleep apnea, and it’s one of the most comfortable sleep appliances available today. The TAP (Thornton Adjustable Positioner III) holds the lower jaw forward at a position that prevents the jaw from falling open during the night and collapsing back into the airway. It is easily adjustable with a single vector mechanism at the front acrylic portion of the upper arch. 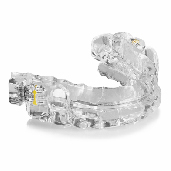 It connects into bars on the lower arch and the jaw is unable to open unless the appliance is dislodged. The acrylic in the posterior section of the appliance doesn’t integrate with the opposing arch, therefore dental changes may be more likely to occur. Persons with reflux should be aware of the constriction that a tight-fitting appliance may cause in the event of a choking or aspiration event. The TAP device may be connected to a CPAP connector to serve as a single unit or the TAP and CPAP can be used concurrently. The EMA device is custom fabricated by a dental laboratory and uses elastomeric sidebands for a pulling forward action on the lower dental arch. The straps are available in different lengths with three different strengths and should be replaced monthly. The appliance is small and comfortable when fabricated with a flex liner. 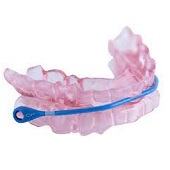 The appliance is best used for snoring in a patient who does not have obstructive apnea that requires consistent replication of the position of the lower jaw. The appliance is well tolerated by most and should likely last 18-24 months before requiring replacement. Latex free elastic bands must be requested. Patients intolerant to methyl methacrylate should not use this appliance. At Powell Dental Sleep Solutions, we take pride in our precision, and in order to design our oral appliances and guarantee that they always have the perfect fit, we don’t simply use a physical impression of the teeth made from messy dental putty. 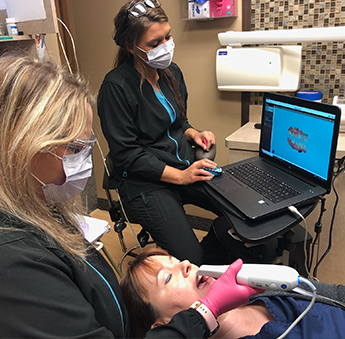 Instead, we utilize our Carestream digital scanner, which is able to create a highly-detailed 3D image of a patient’s bite in minutes using just a few non-contact scans. With it, we can modify and calibrate an oral appliance down to the millimeter, ensuring it provides our patients with the care and quality rest that they need.